The Australian Embassy in Washington has been promoting “100 Years of Mateship” between Australia and the US in the lead-up to the centenary of the Battle of Hamel in the First World War, which has been commemorated this week. The Embassy has come up with a list of 15 eminent Australians and Americans it considers embody the values of the military alliance, to commemorate a battle that took place in France a century ago. It is a list of white men, undoubtedly eminent, 14 of whom are aged over 55 and are former (and one current) prime ministers, presidents, and ambassadors, and one Australian basketball player aged under 30 who plays in the NBA. The intended role of the “patrons” is not clear. This run-of-the-mill public diplomacy initiative in Washington would not normally come to the Australian public’s attention, but an article by Meggie Palmer in Women’s Agenda has given the initiative some unexpected and probably unwanted exposure. Unless you deliberately set out to be inclusive when putting together a conference, a panel discussion, or invitations to an event, chances are you will fill your available spots with prominent white men. Palmer rightly criticised the Embassy for the lack of diversity on this list of “patrons”, which is not representative of Australian society. She recognises that all the patrons have indeed influenced Australia and the world, but questions why the list is all male and mono-cultural, and suggests some admirable additions to make it more relevant. Should we care that this list is all male and mono-cultural? Does it really matter to Australians that staff at our Embassy in Washington have put together a list of important people that they have named “Patrons of Mateship” for the purpose of commemorating a military anniversary few of us knew about? We know Australian governments like to commemorate military anniversaries, and this generally means celebrating men more than women simply because historically there were more men on the front line. In the grand scheme of things for women, where we are battling for equal pay, respect, and equal opportunities, does it matter that there are no women and no reflection of community diversity on a list that has no bearing on our daily lives? In short, yes it does. It matters that one of Australia’s largest embassies, in the capital of a country we are repeatedly told by our government is our most important international partner, could consider it appropriate in 2018 that the spirit of the Australia–US Alliance is best represented by mostly older white men. It matters because the Australian Embassy in Washington is the official face of Australia in the US, and its public diplomacy initiatives are meant to inform and engage the American public, 50% of whom are women and only 31% white men. And it matters because representation matters. 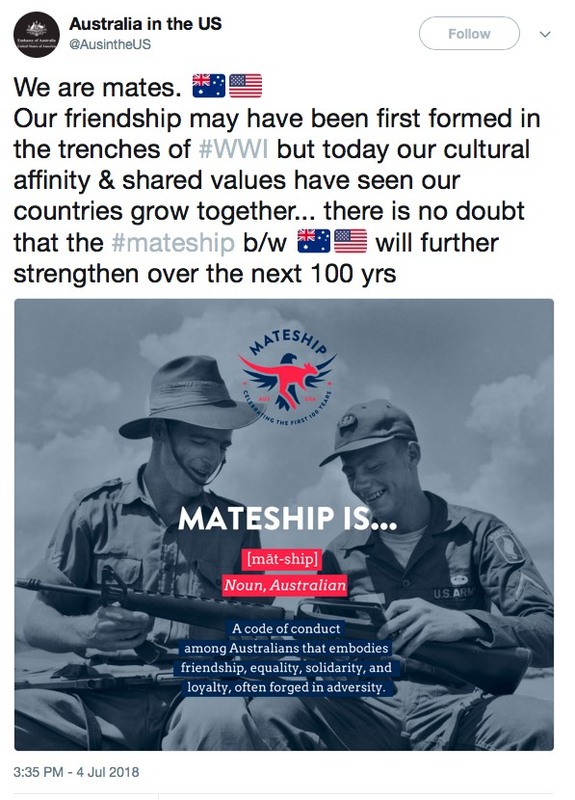 If Australia wants to appeal to young Australian and American women, and right across the spectrum of the community, to continue developing our “mateship” over the next 100 years and, importantly, “beyond the battlefield”, to quote the Embassy, a good start would be publicly recognising (by simply not excluding) the contribution all people have made and continue to make to the relationship. I understand the difficulties of devising a list such as this. There are often diplomatic and bureaucratic sensitivities to manage and political egos to massage. Invitations to the nominees have to be issued and then accepted within a tight deadline, which can result in something less than final and less than perfect being made public. I also understand the complexities of promoting the Australia–US Alliance under a President who doesn’t really believe in it. I can see (if I squint) why it may not be the Australian Embassy’s first priority to ensure there are a few women and a reflection of community diversity on a published list of “mateship patrons” when they are trying to impress the Trump White House. But that still didn’t explain why, as Meggie Palmer pointed out, in an era when Julie Bishop is the Minister for Foreign Affairs and Frances Adamson is the Secretary of the Department of Foreign Affairs and Trade, the Embassy did not think it was important to ensure that prominent supporters of the alliance, such as former prime minister Julia Gillard and secretaries of state Madeleine Albright, Condoleezza Rice, Hillary Clinton, and Colin Powell were on this list before it was published. Or why it included an Australian NBA (male) player, but not a more prominent WNBA (female) player. DFAT is reviewing the Mateship program run by Ambassador Hockey so that it aligns with our commitment to ensure balance, and reflects the diversity of Australia and the United States. Australian Ambassador Joe Hockey has also admitted responsibility on Twitter for the faults in the initiative and agreed it should be fixed. While it’s a shame this wasn’t recognised before the initiative was promoted, late recognition and repair is infinitely better than denial, and DFAT should be congratulated for taking action. I know from personal experience that unless you deliberately set out to be inclusive when you are putting together a conference, a panel discussion, or invitations to an event, chances are you will fill your available spots with prominent white men because they are the people that tend to come to mind first. Ensuring balance and reflecting diversity is not only the right thing to do, but also makes diplomatic initiatives (and conferences and discussion panels) more successful. It will always be tempting to celebrate Australian mateship by harking back to traditional and familiar wartime images, such as this one on the Australian Embassy’s Twitter feed, because it’s easy. But if Australia wants to make “mateship” the centrepiece of its public diplomacy program in the US and successfully promote a concept that “embodies friendship, equality, solidarity and loyalty” into the next century, it would do well to pay closer attention to ensuring its public diplomacy initiatives do not ignore the majority of the public.